Simply elegant bangle adds style to any outfit. 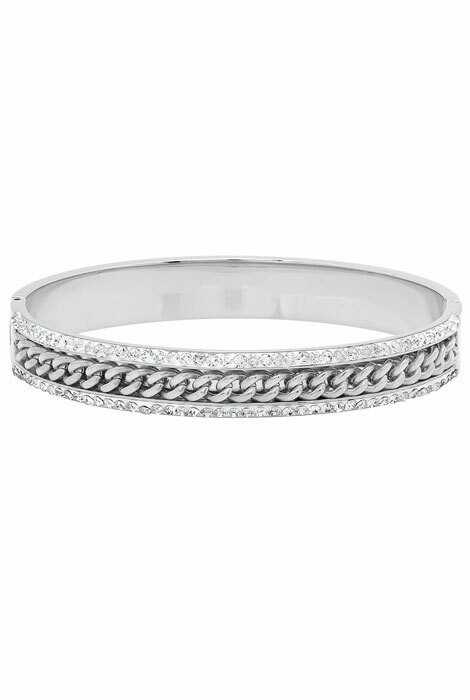 CZ chain bracelet’s edges are accented by rows of sparkling cubic zirconia. Made from stainless steel, a quality choice in jewelry design because of its beautifully polished finish, durability, and resistance to rust, oxidation and discoloration, even in humidity. Choose from silvertone or 18k gold-plated steel to complement any wardrobe. Cubic zirconia bracelet measures 8” dia. with clasp closure. Polish with a soft, dry cloth. Allow 2–3 weeks for delivery. This is a lovely bracelet if one could get it unclasped. There is no way to do this.